As in many countries, Jewish people have had a presence in Estonia for hundreds of years. Historical archives reveal that Jews first arrived in Estonia in the 14th century. However, it was not until the 20th century that the Jewish community of Estonia, a small country that borders Russia and Latvia, encountered a series of important turning points. The Jewish Community Of Tunisia- Is There One? There are many things that make the north African country of Tunisia unique. One of these, historically speaking, is that it was the only Arab nation in the whole world to come under German occupation during WWII. This means that as in many European countries, the Jews of Tunisia were forced into labor, their property was confiscated, and they were required to wear the Star of David. Many were deported; many others were executed. Thanksgiving- is it only an American holiday? New York musician and musicologist Alexander Gelfand once wrote an article entitled, “Tango: Not Jewish, But Not 100% Not Jewish.” How can this be said about one of the most quintessential and well-loved symbols of the country of Argentina? Tango is not exactly known as having Jewish roots. However, like many things within Argentina’s history, it is not without Jewish influence. As A Jew, Should I Be Visiting Siem Reap? The Jewish Chronicle Online recently reported that Jerusalem has been named among the top ten tourist destination cities in the Trip Advisor Travelers’ Choice Awards. For those who have visited amazing sites such as the Western Wall and the City of David, this may come as no surprise. But are you surprised to learn that Siem Reap, Cambodia also ranks among the top ten? 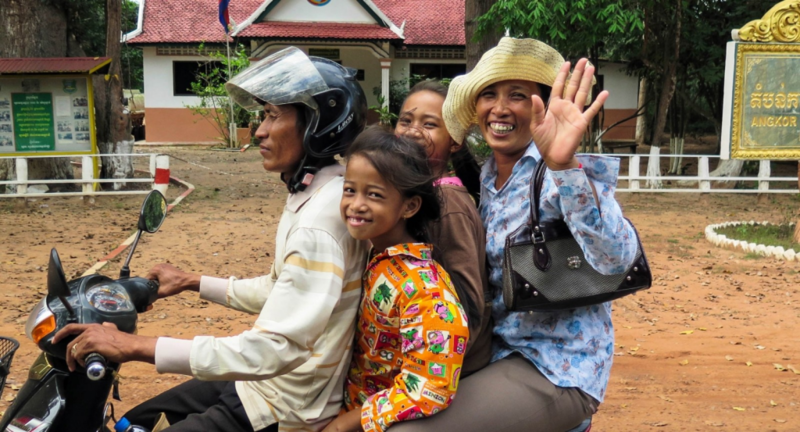 Many people are, because Cambodia is still a country that is often misunderstood. What many people know of Cambodia is the Khmer Rouge regime of 1975 to 1979, which was led by Solath Sar, who is also known as Pol Pot. Pol Pot wanted to make Cambodia into an agrarian society, forcing city dwellers to move to the countryside to work on farms, essentially as slave laborers. In addition to forced slave labor, the people of Cambodia were deprived of proper nutrition, medicine, and health care. The result was that millions of Cambodians perished. Many died of malaria, which could have been relatively easily treated at this time. However in the conditions they were forced to live and work, and with no treatment, it spread quickly and killed many. Hundreds of Cambodians were taken to a secret prison is Phnom Penh, where they tortured and interrogated, and eventually put to death. Due to the rule of the Khmer Rouge regime, about 21% of the total population, or approximately 2.5 million Cambodians, died. As Jews, how can we not feel empathy towards the Cambodians for their suffering? We can feel nothing but compassion and understanding for their hardships. We know that today, each Cambodian has a personal story about how his or her family was touched by the genocide, and the survival stories are deeply haunting. The Cambodian peoples have experienced their own holocaust. Yet much like the Jewish people, today their persecutors have fallen, and they are able to stand proudly. By visiting Cambodia today, it is hard to believe that the country was once the victim of such a cruel regime. Everywhere, you find yourself surrounded by a magical sense of intrigue that is unique to Cambodia. In Siem Reap, you can visit the nearby temples of Angkor, which was the capital of the Khmer Empire from 882 to 1350 AD. In 1992, Angkor was declared an UNESCO World Heritage Site. At this time, it underwent a considerable number of restoration projects, so that today visitors can witness Angkor, and namely its chief temple called Angkor Wat, in all of its glory. The building of Angkor Wat itself is considered to be the world’s largest religious building- and remember, that’s just one building of many! The whole area of Angkor is stunningly expansive and ornate, and displays its own unique type of architecture. You’ll see decorative towers, shaped like lotus buds, climbing towards the sky, and gigantic expanses of murals, carved walls, and moats. Overall, the effect is quite stunning. To get a look at what Angkor Wat, the cherished symbol of Cambodia, watch this short video clip. You may also be surprised to learn that in Cambodia, you will find a Chabad Jewish Center. Their building is located in Phnom Penh, and they host a variety of events, including synagogue services and adult education. They also hold holiday celebrations, such as this Chanukah party in Siem Reap. Browse around Chabad Cambodia’s site while you are there. I always find it fascinating to learn about Jewish culture in some of the far corners of the world- where we may least expect to find it! The Jewish community in Finland is not one that is particularly large. Today, the Jewish community is comprised of a total of about 1,500 individuals out of a total population of about 5 million people. Despite its small size, however, the community is one that has its own interesting history and characteristics. There are a few different places in this world that, when asked, I consider to be “home.” Among them are the New York and Panama. But sometimes there is a difference between what your heart calls home and what your head calls home. Today, I am happy to call the city of Chashmonaim, Israel home; home to both my head and my heart. Are There Really Jews in Japan? The Jewish communities of the 5 Scandinavian countries each have their own unique history, customs, and personalities. As you explore them, you are bound to discover many interesting facts about them. Did you know, for example, that the community of Trondhein, Norway, starts Shabbat and Yom tov at 5:30 PM and ends it at 6:30 PM regardless of when the sun rises and sets? This is because it is one of the northernmost Jewish communities in the world, and daylight hours vary greatly here depending on the time of year. Around the winter solstice, sunset can even occur as early as 2:30 pm. Norway- Since shechita is forbidden in Norway, kosher meat is not easy to come by. Kosher meat is not available at all in Trondheim. There is, however, a kosher meat shop near the synagogue in Oslo. Kosher cheese and bread are widely available in shops here, and you can also find a kosher wine called Adom Atic in the state wine shops. Kosher breads made by a company called Den Gode Landhandel are available in health food shops. Sweden- Stockholm is at the center of the Jewish community in Sweden. Here you will find several different kosher restaurants, including a meat and pareve burger restaurant, and a Kosherian that serves light fare like sandwiches and chips in addition to being a small food mart. The Chabad Lubavitch of Stockholm also has a variety of kosher resources available, and serves a kosher lunch (that requires advance reservations) on weekdays. Iceland- Iceland, with the smallest Jewish population in the world consisting of only about a dozen people, does not have any kosher restaurants. The diversity of the city of Reykjavic does provide dining options, however. There are several vegetarian restaurants in the city that provide good dining options for Jewish travelers. Additionally, a lot of the food is imported from Britain and Norway, which means that you can find some basics such as locally produced spices, lox, and walsa bread crackers, as well as imported cereal and cookies. Finland- An excellent source for kosher food within Finland is Avi’s Deli in Helsinki. The owner, Avi, can arrange to have kosher catering delivered to any location within Finland. Contact the restaurant in advance to arrange to have kosher food, including Shabbat meals, delivered to you. Denmark- You’ll find an array of kosher resources throughout Denmark. The city of Copenhagen has a kosher market called Samson Market. (As they tend to keep unusual hours, it is recommended that you call in advance.) A vegetarian restaurant called RizRaz can be found here too, and is frequented by many locals. Don’t forget to ask which dishes have dairy in them and which do not- there are plenty that don’t. Traveling just about an hour north of Copenhagen, you’ll find a Glatt Kosher Hotel called the Villa Strand. Chabad of Denmark offers Shabbat meals as well.